Night Competition - Spring 2018 - do you want to play? This year we plan to run the 2018 Club Championships as one big event over two weekends, covering both Juniors & Seniors. Finals will be held Sunday afternoon. Depending on entries, some matches may be played under lights on the first weekend (and possibly Friday night). If you wish to compete, tentatively save these dates in your calendar and we wil confirm at the end of May. Deakin University Research Project - EMTC Kids Welcome! 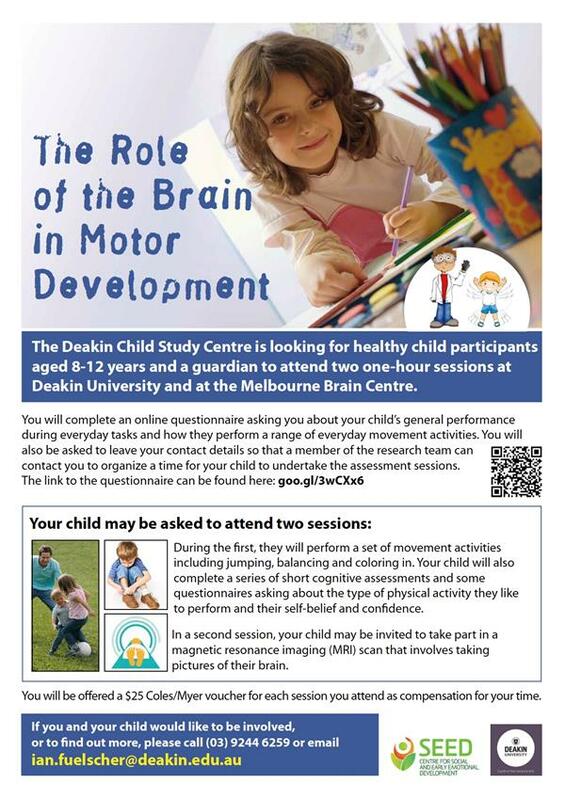 The Deakin Child Study Centre is looking for children aged 8-12 (and a parent) who would like to take part in a research project investigating the role of the brain in motor development. If you and your child would like to be involved, or to find out more, please contact Dr Ian Fuelscher on (03) 9244 6259 or email ian.fuelscher@deakin.edu.au. Do you WATER your courts before play?? A friendly reminder that even though the weather is getting cooler the courts MUST still be watered on a regular basis. Most of the court damage is done during the Autumn/Winter months due to people thinking the courts don't need watering. The courts may look 'darker' due to dew, or colder nights, but underneath they are usually very dry. Unless it has recently rained, you should be giving the courts a sprinkle before playing. This is especially important before ANY Competition, including Night. As has been the case for a couple of years now, the baselines will always need more water than the service boxes due to drainage. It is usually easier to have two people doing the watering - one at the tap and one with the hose. That way you can turn the tap off immeidately if puddles start to form. Thank you for taking the time to care for your courts.